Don't you just love feather jewellery? They are so delicate and warm, and make a great accessory for summer. Ok.....so maybe you decided to buy some.......but what if it's too expensive for you..or if the designs you see in stores don't match your personality? Here is where I come in to give you a hand. I will try to explain as good as I can all the steps here, and if you're not convinced check out the video at the end of this page to understand better the process. Step 1. Push the earring pin through the bead cap, pull it up as much as you can and then bend it at 90 degrees. Cut the pin, leaving about 1 cm. Then take the looping pliers, grab the end of the bended pin and start rolling inwards creating a loop. 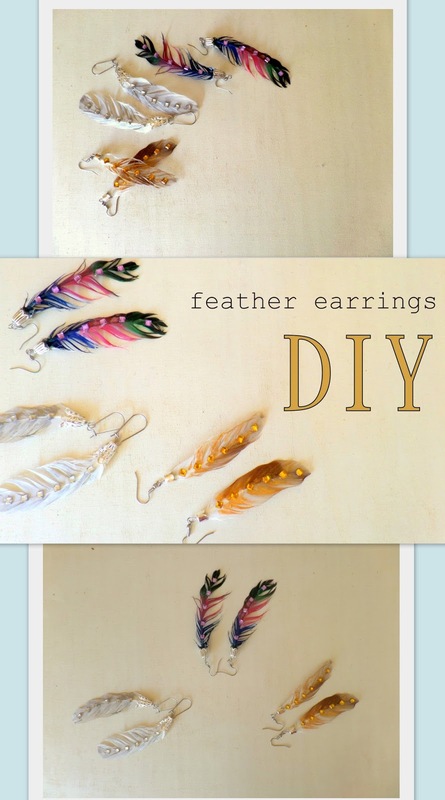 Repeat this step one more time- if you are creating one pair of earrings. Step 2. Take the feathers and cut off the pointed end. Pour glue into the bead cap and then squeeze the feather in there. Let it dry. Step 3. Detach the loop of the earring hook and join it with the loop of the cap.Close it back when you're done. 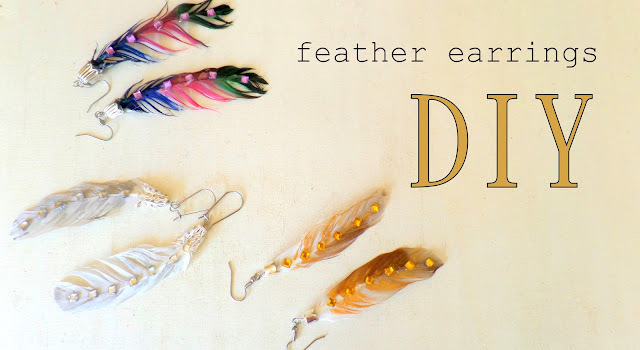 At this point you should have some simple, natural looking feather earrings. Step 4. For the first design I used 3 diferent colors : Dark blue, violet and bright green. Just apply the paint with a brush, and spread the lines of the feather. For the second design I used golden metallic acrylic paint and for the third I used silver color. Step 5. After dried, I applied some dots of glue along the spine of the feather, then placed on them some decorative shinny stones.